← Brother, Can You Paradigm? Beans, it turns out, are awfully good for you. Packed full of protein with no fat, they are filling and muscle building power houses. Which is good news, because we’re going to be consuming a lot of them if this economic thing keeps on keepin’ on. The other night, I fixed some “pole beans” as as side dish. At least that’s what the cashier at Kroger called them. 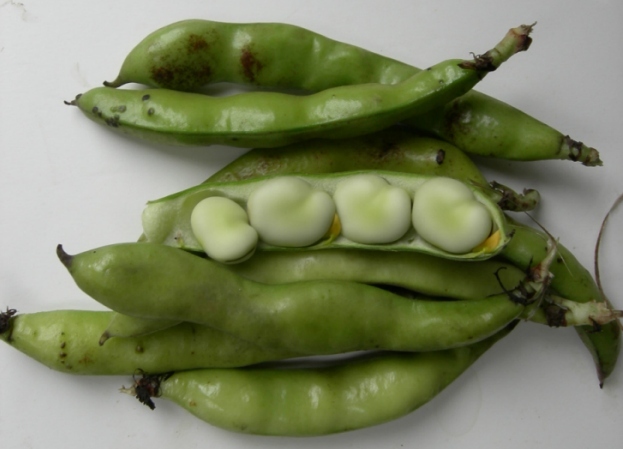 I called them fava beans. Mrs. E. pronounced them delicious. This recipe should work for any sort of bean at all. 1- 2 clove(s) of garlic, chopped. 1 onion, halved or chopped as you like. Sprinkling of oregano, parsley or something else green. 1 thick slice of ham, bacon or salt pork. Route 1: Place beans, olive oil, garlic, salt, pepper, optional tomato and herbs in the pot. Layer the onion over them. Layer the slice of ham/bacon/pork over top of that. Pour over the chicken broth and simmer for thirty minutes or until the beans are fork tender. Route 2: Heat olive oil in the pot. Sauté the onion, garlic and pork (if using salt pork you could render the fat from it and omit the olive oil. But olive oil is very good for you!) Add the rest of the ingredients and simmer as before. You could even serve this as a luncheon main course by adjusting the serving amount and accompanying it with crusty bread, a hunk of cheddar cheese and a light red wine. This entry was posted in Entertaining and tagged Entertaining, fava beans, recipes, side dishes. Bookmark the permalink. 4 Responses to Tough Times? Beans! Oh, I do love the way you can give a “hill a beans” an easy and elegant twist. We had chickpeas the other evening. Love to see your elegant take on that. My sister has our family bean pot, It is silver and stunning. I wish it were mine. Mrs. PvE, a silver ben pot? Now that qualifies as elegant. I don’t think that I’ve ever heard of such a thing! Chickpeas are a good substitute in a salade Niçoise. I also grew up eating them, marinated, as a luncheon sidedish. Chickpeas work well with pasta and rosemary. A traditional Roman dish that I find delicious. Substantial, nutritious and won’t make you pack on the pounds. Perfect. Fresh beans have been a staple at the market. I’m not so sure it’s the taste as it is my son’s delight in getting to fetch fistfuls to drop in the bag. Looking forward to trying your take… so many favorite flavors listed in your recipe.